By Oisin O'Callaghan | December 14, 2010. 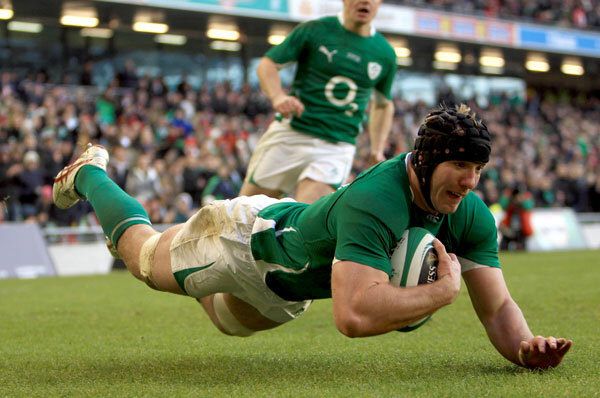 Ireland ended their November test series on a high as they beat Argentina 29-9 at the Aviva Stadium. Ireland were the better side in an uninspiring clash with the Pumas and they had the boot of Jonathan Sexton to thank for their impressive score line. Tries from Stephen Ferris and Gordon D’Arcy added to the 17 points scored by the fly-half who with 12 minutes to go made way for Ronan O’Gara who added the final two points by converting D’Arcy’s try. It could have been worse for the Pumas as replacement Keith Earls inexplicably had a try disallowed.The away side started well and put pressure on Ireland in the first ten minutes. However, eventually their lack of discipline cost them and it wasn’t long before Sexton got his first three points on the board.Ferris rounded off some brilliant play from man of the match Jamie Heaslip and Sexton converted and added three further penalties to give Ireland a 19-3 point lead at the break. The second half was a bit tighter with the only points coming from the teams’ fly-halves. Ex-Leinster star Felipe Contepomi reduced Argentina’s deficit to 22-9 but Ireland never looked like surrendering their lead. He was wasteful and botched three penalty attempts along with two drop-kick attempts. D’Arcy sealed the win with his late try and Ireland left the pitch relatively happy with their performance – which could do with some improvement it must be said. That ended Ireland’s autumn internationals with two wins out of four. Losses to South Africa and New Zealand show there is much work needed to be done if we are to compete with the southern hemisphere countries in next year’s World Cup.